Last week SDOT posted some nice construction photos of King Street Station’s progress, and thought the progress was coming along nicely. But yesterday SDOT put these photos on the KSS project’s facebook page, and well, all I can say is a lot can change in a single week. 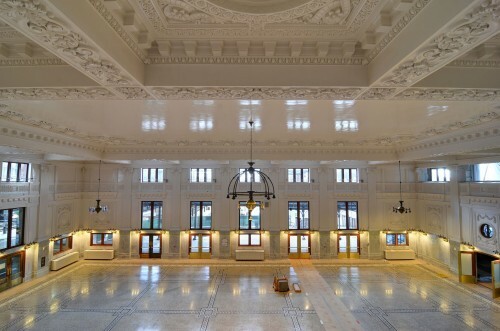 Wednesday, April 24, 11:00 a.m. to 11:45 a.m.
King Street station update, courtesy SDOT. I am really looking forward to seeing the finished project for myself. I sneaked a peek on Sunday night, when I was getting off the Cascades from Vancouver. It looked beautiful. I can’t wait for it to open. They did a great job. Recommend heading to Vancouver and trying out the SkyTrain. Please tell me they’ll assign seats for this event by handing out yellow bits of card with numbers on them. I recently asked an Amtrak employee (in a polite, conversational, non-foamer way) why they do the long lines and seat assignments, as opposed to the NE corridor method of just getting on the train, and said it was a state requirement. Cascades is run by Amtrak as a contract service to WSDOT and ODOT; they call all the shots, so the Amtrak employee is correct. Some of the STB authors have tried to talk sense into WSDOT on the absurd seating arrangements at SEA, PDX and VAC, to no avail. The agency regards it as a feature, not a bug, an opinion I can attribute only to a provincial failure on the part of someone on high to have traveled enough to experience a decent intercity rail service. Washington State has a dumb rule with clear adverse consequences. The number of STB’ers riding the train must not outnumber the traveller’s that don’t care. That might be because the train frequency isn’t high enough to have the same ‘commute’ style travel the NEC does. Maybe things will change when the Point Defiance Bypass project is finished. If they’re dead set on assigned seating you’d think they could at least let you pick a seat when you buy the ticket, as airlines have done since the invention of the seat. Better to go to unassigned style seating rather than waste the money on IT for upgrades that would have minimal benefit. Deutsche Bahn’s system of assigned seats for tickets purchased ahead of time and sitting in unassigned seats for tickets purchased day of, seems to work like a well oiled charm. How do you know if a seat is unassigned? If you’re going from Seattle to Portland it might look empty but someone boarding in Tacoma could have it reserved. There is no assigned seating for Tacoma boardings. They do, however, tend to send Tacoma boardings to a car left empty by the reserved-seat process in Seattle. A car which will likely remain mostly empty the rest of the trip, even if you’re sitting next to a stranger in your full Seattle-Portland car. Nothing about this process makes sense. Since I haven’t ridden the equivalent rail system outside of the US, I will have to rely on someone here to keep things honest. There are 3 things I see that the US does differently, and probably come into play here. What benefit do you see in the ability to choose seating ahead of time? Some people prefer windows, others want an aisle. There’s also some peace of mind knowing that you have a (specific) seat waiting for you. That said, I’d much rather have open, first-come first-served seating compared to the silly process we have now. I wish I could pre-book my seat. Seats are also pre-assigned in France on the TCG and Thalys services. That’s why I’m asking the question, what is it you’re looking for by pre-booking your seat, as opposed to just open seating? David says windor or aisle is important to him. If you’ve ridden on European trains (I haven’t), then can you see what one of the differences is? @Bernie In Germany, they have little Marquee readers for every seat. If it’s blank, it’s unassigned for either the whole trip or a very large portion of the trip. For example, I took the train from Bremen to Cologne. The seat next to me was empty, but the marquee said “Dortmund – Köln”, meaning someone could sit there until the reserved passenger got on in Dortmund. The two seats across the aisle were both empty and the marquee was blank. However, just before arriving in Cologne, the marquee popped on with a Cologne to (a destination that escapes me). When I was there in 2000, they did a little less high tech, but labor intensive, version, where they stick paper stubs above every seat with the boarding and destination of every reserved seat, which also helps the ticket checker. The other beauty is that on your reserved ticket, they even tell you the car number that you’ll find your seat, so you can even be waiting at the correct spot on the platform. If you don’t have a reserved seat, you get on at any car, as long as it’s not first class, and find an empty seat. I don’t think Amtrak should move to unassigned seats. It’s nice to be able to reserve ahead of time and ensure you get to sit with your traveling companions. German-style reservation technology is obviously there and while it would take time and money to implement it, I think the time savings would pay off in the future. 1) Having to wait the extra 1/2 hour to board for check-in at Seattle & Portland. 2) Choice of Window or Aisle. 3) Business Class preference for the single seats. I don’t what the mindset at WSDOT is for not having open seating, I can only speculate. Maybe to cater to the family, or vacation type traveller, to better group them, say around tables, or facing each other. Also the issue of side-of-the-train preference. 1) Europe supports their train network with funding. 2) Equipment made for the US market requires that the seating accommodate our need to be facing forward, hence the swivel seating. 3) Trainsets, and train cars don’t care if they’re running forward or backward. (only the people inside seem to care). Therefore, if one wanted to pick out their own seats in advance, there are only a few parameters you can count on being consistent regardless of what configuration the train is running in that day. So great to see this restored. Looks fantastic! Are there before / after photos? It takes some time to get the cardinal directions straight, so much has changed. By zooming, I figured out the top photo is looking south, the bottom photo is looking west. Plus that open door into the old ‘Ladies Waiting Room/Agent’s office’ area helped. Something is really weird about that directional lighting. It has the effect of fragmenting and compartmentalizing the lower fourth of the room, in a much more jarring and discomforting way than the architects intended by their initial segregation of materials. I’ll have to wait to find out if it has the same problem in person, but in both of the above photographs the artificial internal horizon is quite unpleasant. Looks like the fixtures are placed in the same positions as they originally were. I’ll bet the fixtures are visually the same as before as well. What may well be different is the lambing of these fixtures, probably a cooler and more white light quality and no longer incandescent. It does look weird right now, but it may change once they put other fixtures and the furniture back in. Hopefully it won’t be as distracting then. Otherwise, I love it! HUGE props to the restoration teams! Agreed. It makes for an instant headache. If the fixtures were modified to allow some of the light to go up as well it would go a long way toward remedying this. The lights are not adjusted yet and do not have their globes attached. They are very much like the originals and it give the place a soft warm glow. Interestingly enough, the originals were made to be fired either by glass or electric. Does this mean Sounder trains will move from the outside platform? That seems pretty unlikely, given the investments in the Weller St. bridge and the north exits from the platform. And the platforms themselves. They didn’t exist before Sound Transit. Then it’s too bad that hardly anyone will actually get to experience this beautiful expensive restoration project. They have places to go, things to do. Amtrak passengers get to wait around a while. Beautiful. Seattle should be proud of this. I just got back from NYC, and the contrast between Penn Station and Grand Central is absurd. 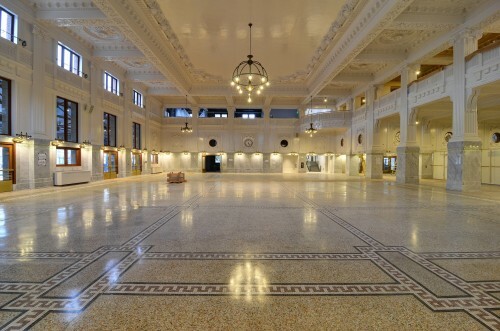 Train terminals for large cities should be functional works of art; and Seattle now has this in King St. Station. And we have a disfunctional work of art in Union Station too. The difference being that Union Station is only a work of art, while Penn Station is only a train station. The difference is in Penn Station there’s stuff to do while you wait. It’s actually functional. This looks nice, but that’s about it. Grand Central manages to do both. If Seattle starts seeing higher frequency Amtrak service, there might be enough traffic to justify constructing an attached building just south of King St. that would have some commercial space. I’m fairly confident that’s the intent for restoring the upper floors (former BNSF office space) – to provide commercial space. So will the Jackson Street grand staircase be opening next week too? Before this thread descends into a collection of non-sequiturs (as evidenced by the last three comments) let me just say that this looks great. Some people just like to be angry. Yes, it certainly looks great. I think I need to take a trip some where . . . . .
Just beautiful. I’m so proud of my hometown. They did a fantastic job. This looks absolutely stunning. It’s hard to believe it’s the same place as before. After following this project my whole life I’m shocked to actually see results. I am curious though as to how Amtrak will furnish the space. -Do they have enough of Union Station’s old benches to fill the floor without having to use the crappy old nogga & steel furniture as filler? -Will they be using sympathetic and/or digital signage or will they be whipping out the old felt board with plastic letters? -Is there room for any kind of cafe/news-stand/convenience type store in the station close to passenger areas? -The women’s waiting room obviously hasn’t been touched since the seismic steel work wrapped-up. I know they are waiting for funds but how long until we see that finished? No, they did not restore the two water fountains – under the clock and between door one and two — but they were leaky and problematic from the start. I am with you. I hope Amtrak is very careful in the way they furnish and equip the place. They do need a news stand. I was told that the Women’s waiting room restoration will cost about 1million. It would have been about 600,000-700,000 if it could have been done with the project. You provide the funding and they will do it. It would make and ideal starbucks or first class lounge. Very nice! And will look even better (and a bit less harsh) once the globes are put on the light fixtures and the furniture is installed. Looks great though. Hopefully we can finish all the other bits and pieces and add more services – if so it will be a real gem. And it sure beats both Portland and VanBC. At last! I’ve been waiting for this moment for decades!